I believe the words we use are very influenced by our particular location. So – how do we find our true voices? This is a question I keep coming back to. How the place – the landscape we live in influences us and my focus is on the words we choose and use and how a word might influence the gestures used in a painting. What is the constructive response to the dwindling number of libraries around the UK? How the shape of the landscape influences the shape of its letters. During my upcoming performance at UnDegUn (following a Lost Library workshop at Ty Pawb on 24th November) the using of my body as first absorption of questions feels right and connected to my slow and physical essence. Becoming more connected and aware of my physical responses to questions, might enable me to understand things on a different level. The kinaesthetic approach as a way of learning is well documented and I’ll apply it to understanding questions posed. 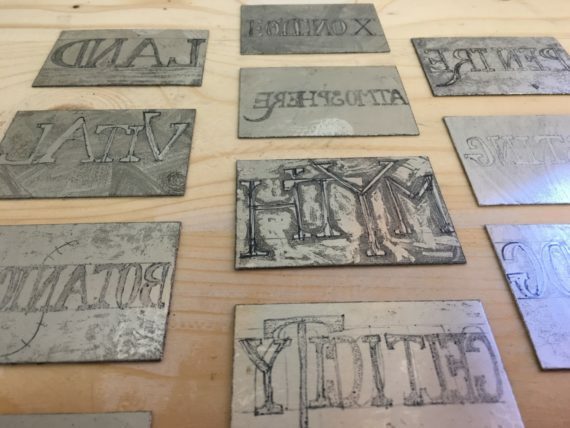 In learning anything I have to be very active in getting to grips with material. This may be universal…? I was wearing stripes in my Lost Library costume to signify mime artists and silence, but this effect is watered down especially by the recent fashion for black and white stripes. Yet I do not need to lose the stripes completely, the jacket needs to be adapted for bodily movement – I’ll put stretch material at the seems to allow a fuller range of movements when wearing it. I think I now need to tune the costume into myself more – perhaps a cream polo neck (goes with the cream typed words, membership cards and registration forms in the performance) and (stretch) green velvet bottoms, perhaps ragged at the bottom. What I’ve described above reads ‘lost’ more to me. ‘I find the more I learn about Art (in the broadest sense of the word), the greater my appetite becomes for knowledge. I pay particular attention to thinking beyond the surface of people and objects, not to judge but to look beyond the obvious. For knowledge to grow you need to take it into another environment. Which is so true and something I’m going to ponder, as it needs deeper thought. Q: Are the movements/gestures important in reflecting on libraries? I find I have come a full circle in thinking about movement in response to words since first dreaming up the lost library project (in 2015, which coincides with the inception of the Bathing In Ignorance series of paintings) – back then I was thinking of dancers responding to the texts within the library, a turning the text into physical movements and now I am responding through movement, if requested to on the registration form. 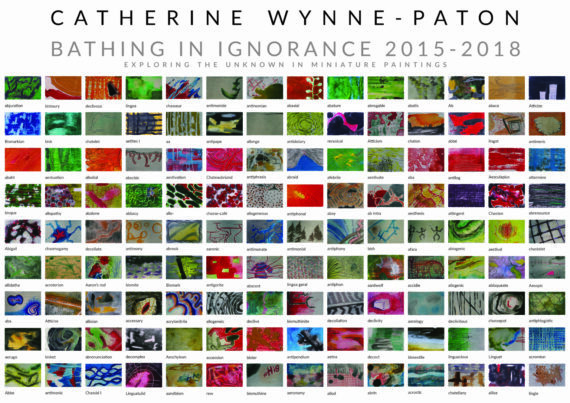 The movements I am using in response to the questions are an intuitive, unfurling response to written words, in a similar way to how I responded to individual words in the 254 paintings in my Bathing In Ignorance series. Doing something social and communicative is important in reflecting on how our society is functioning, rather than leaping straight into solutions. The allowing time for as many people to be involved in the thinking about things, not just the debate is important, as a collective stepping back. Reading benefits me personally and furthers my own understanding of the world, but what is the use of this if I don’t do anything with what I’ve picked up? I’m interested in how a particular place, the landscape and the people in it, influences the gestures and the words we each use? And, if there is a strong influence – how do we find our individual voices with all this exterior pressure going on? How to resist being persuaded by vocal individual of this and of that? The only way I know of finding my voice is by talking, writing, moving and doing, even, and especially when I’m uncertain. Certainty has no place here. I have many questions I’m trying to find answers to in relation to The Lost Library and I know there is a really important underlying question, much more specific than I’ve formulated so far, question improvement in progress! Preparations for The Lost Library at The Wrexham Open. Dwindling libraries – what is being done around the UK and to what effect? How do and how can libraries can best support communities? What is now essential in a library? Does free access to text enhance social cohesion? Collecting and collections, in particular words, lexicons, dictionaries. Communicating and connecting in a multi-lingual society. The landscape of a place affecting communication – on writing. Over the past week I’ve had two rehearsals of The Lost Library where I performed a joining ritual with people, whilst mute, participants completed a registration form, asked me a question on the form which I responded through a gesture or bodily movement, received a library card and one word. The Librarian character – so far I’ve played a stock broker, myself and pushed that through being mute throughout rehearsals (and previously at Deptford X Fringe – being mute for 6 hours) , but I now find the lost librarians character is that of a warrior, who is fighting to connect with people and place through a living archive (the lost library word collection of that place). The word collecting activity I originally came up with – asking people for stories about Wrexham – has proved too arbitrary – so last week I asked new members to put their favourite word on the form – but it is still not right. I am pondering instead using one of the words from my word collection (currently has 14* words) as the starting point of the Wrexham collection. Where participants join the library, receive a card and a word, fill in the form and we talk whilst harvesting honesty seeds. There’s actually not too much pondering to do, I’ve worked with honesty now twice before in performance, most recently at a car boot sale and before that at a business networking breakfast. Collecting words while also collecting seeds would have a less formal feel to it – and the words collected would have been thought about for a little longer, in a relaxed setting and so more meaningful to the individual. Allowing a stepping back. When I am mute and awaiting people to fill in a form I find it’s all a bit formal and far too much like an exam, with a strange pressure, which is not my intention. I don’t need to put others on the spot like that – it’s not helpful in gathering words that actually mean something to them. 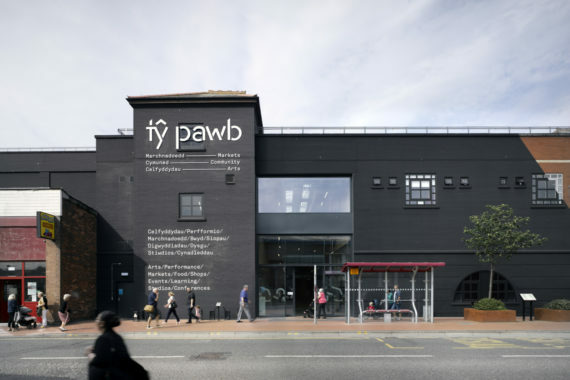 This word collecting session/s would be a workshop, I have two appearances in each of Ty Pawb (was Oriel Wrexham) and UnDegUn – the first appearances being harvesting and word gathering and the next sessions being The Lost Library appearances using the words generated in those sessions. Join here and grow the Lost Library Wrexham word collection with me. *tribal, celticity, honesty, atmosphere, equinox, pentre, voice, land, myth, vital, botanical, posting, clarity. I am currently transforming my studio – I’ve moved and painted the exterior blue, the interior has now been insulated, I’ve painted it white and building shelves and worktops. It is an equally big transformation for me psychologically as I create the place and space I want to make things happen and I am clearing out headspace and centring myself before a thoughtful and concise period of work. I have always loved the colour blue. Now it feels an appropriate time to allow myself to feel it as last year my half-brother Stuart died and the loss of my step-father in a car accident when I was 23 and an unfortunately high number of deaths of other people key in my life has left me with ongoing feelings of loss. Something which has struck me as incredibly hopeful and beautiful is Stuart’s mother and step-father planting rhododendrons in their rainbow wood behind their house (named after DH Lawrence’s The Rainbow.) This got me thinking about the hope and associations of colours. Having just painted my studio blue I am embracing both the colour and its associations and life as it happens. It is also my long-time favourite colour. 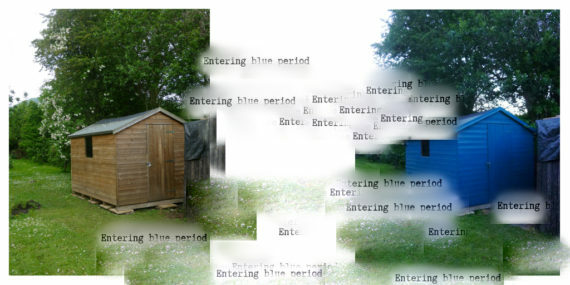 The blue of my shed reminds me it is ok (even if it doesn’t feel that way) to feel loss, to grieve and to understand that this loss is always going to be there with me. Loss of someone who’s been a part of my life, in the end reminds me to go forth in what I do more boldly and bravely than I have before so that something very positive goes into the future with me from those who are gone. Then they are not entirely lost. It is the way I function after the shock of loss, it also means I can think and talk about them as if they are simply in a parallel universe; not exactly gone forever. I look at the world as if they are systems within an overall Gaia-like system and I am using the discipline of a structured process system, creating the prime conditions for me to make my best work. I am more like an orchid than a daisy in the type of environment I thrive in and need things to be in quite a particular way. My rules. My method of making work has echoes of Sol le Witt, Art & Language’s a social base in shared conversation and the highly organised way social media professionals schedule their posts for maximum impact. Doing these things I must do, all the while keeping lost people etched into my neural connections and showing up in unexpected places within my work. Early one February morning at Abergavenny Morning! Networking meeting, attendees have 45 seconds each to introduce themselves and their businesses to the 40+ people in the room. When my turn came around I introduced myself and photographer Jane who I’d invited along and removed my scarf revealing a large cardboard badge with “The only language that matters?” painted on it. Approaching the nearest table, I began handing out large round seeds from a black drawstring bag. Jane began photographing the exchange as I made my way slowly around the room and with only a few seconds left I asked the room if they knew what type of seed it was and then revealed its name. I was later asked Do you think honesty is the only language that matters? To which I replied Yes. Taking art into a business networking context. I’m considering alternative ways of showing art, my art in particular as this is a context I’m experimenting with. With my work being about people, communication and words the networking context is an intriguing situation in which to place it.